The 60-758 4-zone output SnapCard alarm expansion module lets you control devices by adding hardwired outputs to a GE Concord, Concord Express or Advent alarm control panel. The 60-758 output SnapCard can be installed into the GE Concord and Concord Express expansion connector. 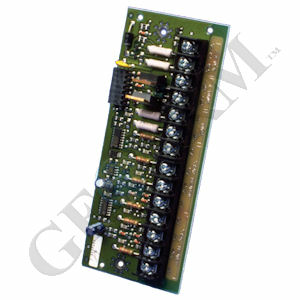 On GE Advent panels, this card can be installed into the primary or secondary expansion connector and in combination with other expansion cards. The 60-758 includes (4) "Form C" dry contact relays. The relays are controlled by a alarm touchpad or a combination of states and events in the GE security system programming. The (4) outputs may be programmed to turn on lights, open drapes and garage doors, turn on a closed-circuit-TV (CCTV) camera during a burglarly alarm, turn exit lighting on during fire alarms, and activate backup cellular phones or long-range radios if primary alarm communications are inoperable.